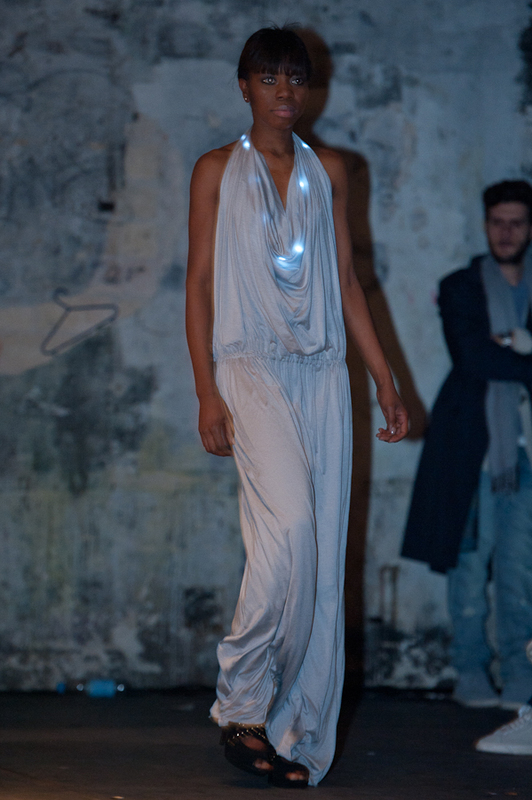 Moon Berlin, a Berlin-based design label led by Brigitte Franken and Christian Bruns, recently launched their collection “I’m not a robot” at Berlin Fashion Week (January 2011) integrating soft-circuit LEDs into elegant bespoke designs. They are one of the few designers presently taking on the integration of high-tech into couture designs which is aimed at the market. Did you both always want to be fashion designers, and why? Christian: No, it was more by accident. I knew that I wanted do a creative profession, but I didn’t really know what exactly. After finishing school I went to New York where I decided to study fashion design. When I was younger I wanted to be a cartoonist. Brigitte: I was interested in fashion very early. I often created my own designs and was also interested in art, colors, shapes… I started with an apprenticeship in tailoring for three years and afterwards decided to study fashion design. We both studied fashion design in the fashion department of Fachhochschule Trier. Could you tell me a bit more about the school? I understand it’s quite a well known fashion design school in Germany. The fashion design department of Fachhochschule Trier is one of the best known schools for fashion design in Germany. It is a public school, but with very small classes, so you have the possibility to study very exclusively. You also have to take a recruitment test in order to be able to study there. Christian and I met at a Berlin design agency where we worked as freelance designers. Christian had worked on the integration of light into fashion for some time and his diploma and final collection “Mirkro” was also about this. While working together I (Brigitte) got “infected” by the idea of wearables. So we started our own label, Moon Berlin, in 2009. As designers we are always looking for ways to put fashion on a new level and we are fascinated by the challenge of bringing technical innovations into wearable clothing. What led you to designing fashion that uses technology? As designers we are always looking for ways to put fashion on a new level and we are fascinated by the challenge of bringing technical innovations into wearable clothing. Using light in textiles as an additional element of art is one of our most important starting-point for this. Please describe the Moon Berlin studio – where are you located, how many designers/technologists work with you, and how are the garments produced? Our studio is in Greifswalderstr. in the Prenzlauer Berg neighborhood of Berlin. There we both design and develop the prototypes, while the production is made by tailors. We also work with two assistants and “our” technologists come from the Fraunhofer Institute IZM. Are your designs made in Berlin? The fabrics are made in France, and the garments are tailored here in Berlin. We are inspired more by the Berlin of the 1920-30s with its very classic and elegant style, and this is reflected in the shape and kinds of materials we use, i.e. silk, chiffon and satin. Of course Berlin is one of the most important centers for cultural and creative innovation. However, our fashion doesn’t show the rough, wild and dirty side of the present Berlin. We are inspired more by the Berlin of the 1920-30s with its very classic and elegant style, and this is reflected in the shape and kinds of materials we use, i.e. silk, chiffon and satin. Moon Berlin Show1811 from Manuel Stettner on Vimeo. Moon Berlin’s first collection “I’m not a robot” integrates LEDs. Why did you choose this particular technology? How do you perceive lighting being integrated into clothing? Is this just a trend or something which will become more and more common as a design ‘element’ in your opinion? Light is an important element of our design and LEDs are the best way to do it. 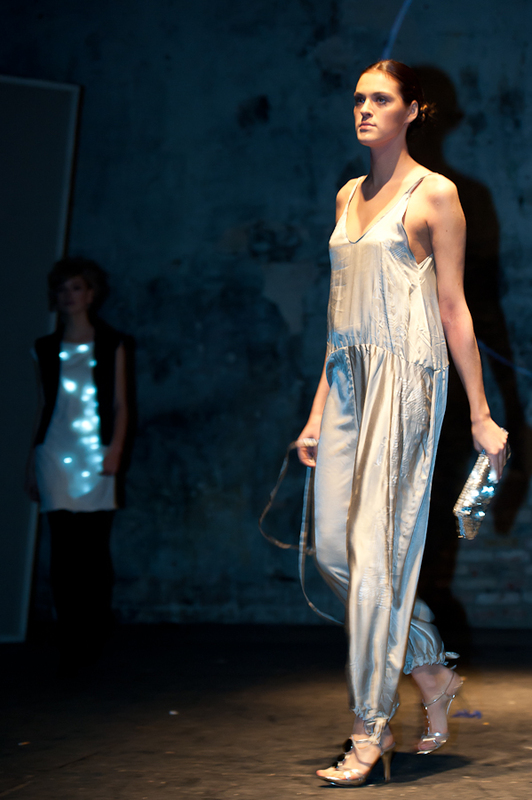 With light we are entering a new age of fashion. We believe that in a few years textiles with integrated light and intelligent technology will be quite common. Sometimes the technology limits you but on another hand sometimes it shows you new ways to go. I understand you collaborated with Stretchable Circuits from the Fraunhofer Institute IZM to develop the LEDs integrated into your designs? How did the collaboration with the Fraunhofer Institute IZM come about and how did it influence your designs? Brigitte contacted the Fraunhofer Institute IZM after reading an article about their research concerning wearables. We met with them and discovered that we had a good basis for collaboration: the technologists liked our fashion and their stretchable circuits matched our pieces. “Form follows function.” Sometimes the technology limits you but on another hand sometimes it shows you new ways to go. How much does the integration of LEDs dictate the aesthetics of your designs? Did you have to rethink, for example, the choice of materials and cuts to accommodate the technology? Can you explain in more detail some of the technical hurdles? For example, there were some problems with washability in the beginning, because you can wash the the stretchable circuits in water, but you can´t wash the silk in water. The silk is normally cleaned by chemicals, but the chemicals destroyed the circuits. So, it took some time until a solution was found. What was the solution? A cooperative laundry found an solution for cleaning the garments by professional wet cleaning without mechanical stress. Cleaning the silk was one of the most complicated things. Cotton, for example, is much easier. The integration of light technology is not meant to lead to a futuristic style but we want to use futuristic technology to create an elegant classical image. When viewing the collection, I perceived an influence of pre-WWI aesthetics and designs – such as the loose eastern-influenced bohemian designs of Paul Poiret, considered by many as the first ‘modern’ fashion designer. Also the use of metalics seemed nostalgic of a distant concept of the “future” as perceive in designs of the early 20th century. Did the “idea” of the future as conceived at certain points in the history of fashion influence your designs? Were you influenced by any particular fashion designers from the past? The integration of light technology is not meant to lead to a futuristic style but we want to use futuristic technology to create an elegant classical image which is inspired by the glamorous, elegant and sophisticated style of the 1920-30s, as well as the draped dresses of ancient greece. Furthermore we were inspired by the metal-plate-dresses of Paco Rabanne, designed in the 60s, and, of course. by the movie “Tron“ – the original one from the 80s, one of the first computerized movies. The use of the metallic fabrics is like a connection between the classical styles of the 1920-30s and current high tech technologies. What do you think technology in general brings to the craft and role of fashion? Fashion is a combination of clothing and an article of daily use. It is not only about covering and decorating the body, it also fulfills different functions. For example, light (in clothing) can be used as a decoration but it can also help avoid accidents in traffic. Our mission is to create clothes you can really wear in “daily life” or rather, “nightly life” ;). 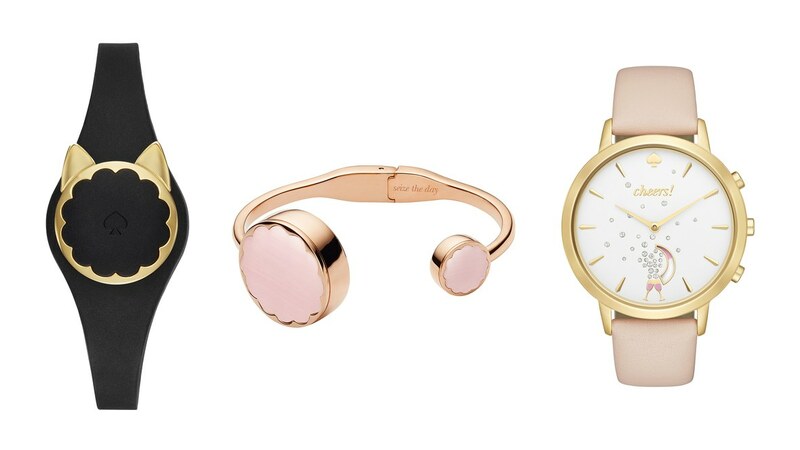 Are there wearables designers you have been inspired by? Of course we know the work of a lot of designers and technicians such as Hussein Chalayan, Moritz Waldemeyer, Cute Circuit, Nike etc., who have worked with the integration of light into textiles and one is of course inspired by everything one sees. However, we don’t really have an idol in the field of illuminated textiles. The thing is that most of the designs thus far have been done for the stage or as art projects. Our mission is to create clothes you can really wear in “daily life” or rather, “nightly life” ;). Do you anticipate using other wearables technologies? What will your next collection explore, both conceptually and in terms of technologies? The designs for the next collection are already done. The theme of this collection will be art deco and origami. We will again collaborate with Fraunhofer Institute IZM and Stretchable Circuits (for the technology) and we want to develop indirect light effects for the collection, so that you cannot see the light directly, but only the shine of it, intensifying and accentuating the shapes and patterns. When do you anticipate launching this next collection? It will be launched during the next Berlin Fashion Week Summer 2011. If the technical elements need more time, however, we will present our collection in January 2012, also for Berlin Fashion Week. MOON Berlin from moon berlin on Vimeo. For whom are your wearables conceived? What kind of clientele are you designing for? For every woman who likes to present herself in public, who likes to wear something special and who is open-minded in terms of innovation. Did you imagine a specific social contexts were the Moon Berlin designs would be worn? Our designs are perfect for parties, evening events, night clubbing or just for dinner – and of course the red carpet or on stage. For our suits and trousers we looked to Marlene Dietrich for inspiration. Do you have a ‘dream’ customer or muse? Living, past or even fictional? For example I imagine strong women such as the 1930s film star Jean Harlow, or Tilda Swinton looking quite ‘dazzling’ in your designs – or the fictional Snow Queen from the Hans Christian Andersen fairy tale by the same name as a perfect muse! Tilda Swinton would be an honor for us. For our suits and trousers we looked to Marlene Dietrich for inspiration. 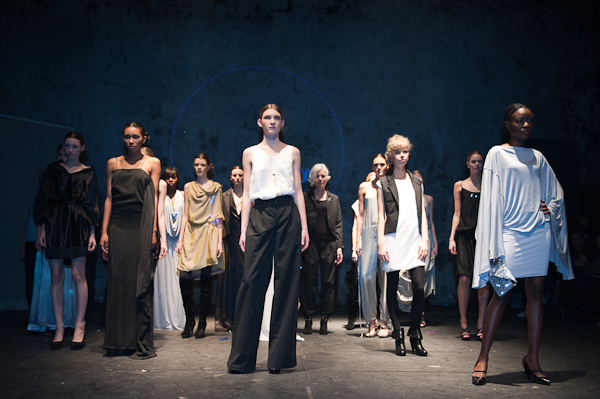 Your designs were launched at the recent Berlin Fashion Week. How and where else do you plan on disseminating your collection? Fashion fairs, retail, or our own store (we’re looking into this). Where/how can the Fashioning Technology reader order some of your designs? You can contact us directly, because we are only producing made to order at the moment. In a few weeks you will be able to buy some pieces from two online shops: Nelou and Not Just a Label, these will also be on an individual request basis. Presently, we are more involved in public relations side of things than really starting the business, because we know that when you start a fashion label it takes some time before you really begin to sell. Do you see a resistance in the fashion world to working with technology or would you characterize the fashion milieu as embracing uses of technology (either in production or integrated into the garments )? There were / are designers who have worked with the topic, such as Nike etc. However, it is a big challenge to bring technology into wearable fashion and to make it market-ready. 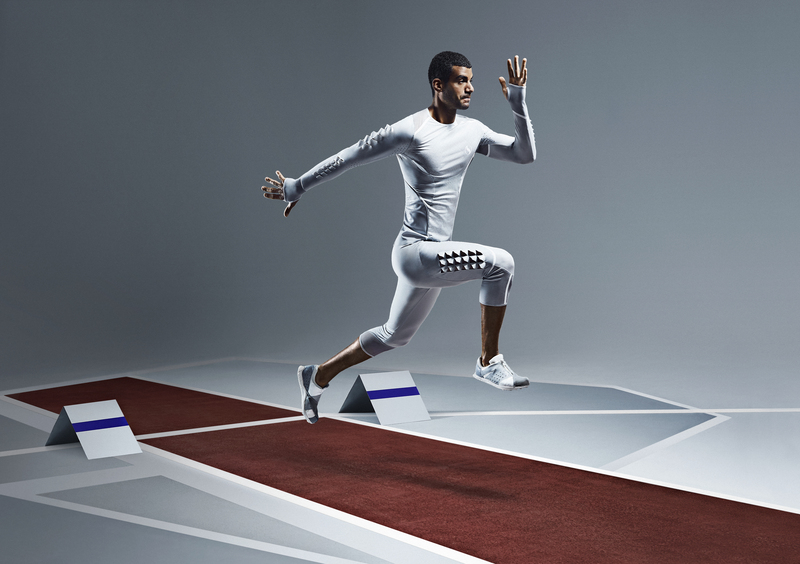 What role does ‘performance’ play in the types of garments that you design? 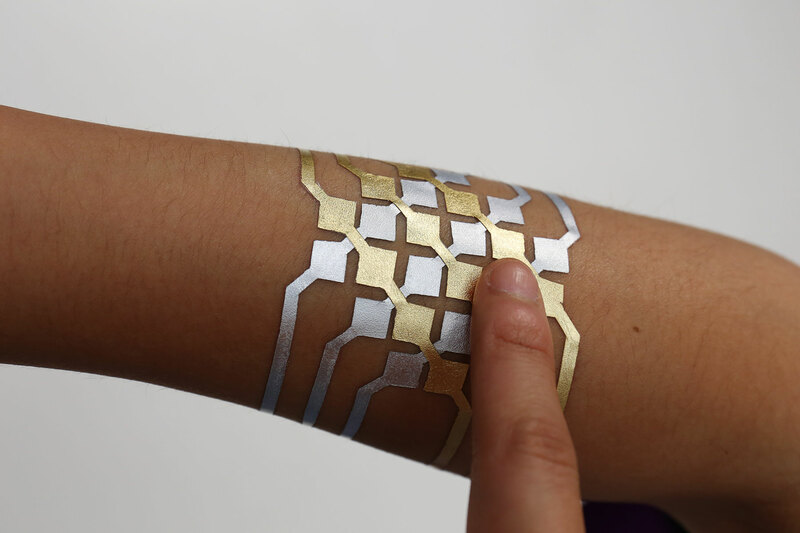 The technology has a movement sensor that reacts to the movements of the body. If you move fast, the LEDs sparkle faster, and if you stand still they will glow softly and slowly. Do you imagine your designs being worn by performers, or dancers? If so – how, in your opinion, would this change the way you design? Yes, we could imagine our clothes in a Pina Bausch performance for example. A movie celebrating her work premiered last week during the film festival Berlinale. It is very good. Pina was a choreographer from my home area of Wuppertal and she was very famous for her dance theatre. She unfortunately died shortly before they started doing this movie. Fabric has its own movement, our bodies move – and the technology reacts to it. Do wearables, in your opinion, have the ability to transform the way we perceive, present, and use our bodies and if so, how? Of course – if you are wearing an illuminated dress, you will get more attention from other people – automatically you will behave different. If you can lead the intensity or performance of technology with the movement of your body, you will use it for that, and maybe that creates a completely new way of moving and behaving – exciting!